I am an avid picture taker. Even as a teenager, I remember getting my first camera, inserting the new roll of film and snapping away. My photo albums are a real scream to look at now because I was such an amateur! I have always had a love for photography and when my first child was born, I snapped over 1,000 photos in her first year of life. She was definitely a photogenic baby and this momma LOVED taking her picture! Along with photography, I am a HUGE fan of scrap booking. I don't do the online scrapbooks though...I am the traditional scrapbooker. I get all my own papers, and save all my memorabilia. My books are my own thoughts, creations and designs and they look very personalized when I am finished with them. I just recently finished my son's scrapbook of his birth and the days following...what a special keepsake it is for me! If you are into preserving and making memories then you are going to LOVE this review!! I am going to introduce you to Mixbook...an online photo book company that I am thrilled with and know that you will be too! 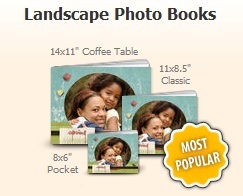 They offer a multitude of photo books, including Family Photo Albums, Baby Books and Seasonal Books. Here is a bit more about Mixbook and what you can create with them! Like I said, I am a fan of scrapbooking so I was really excited to try out Mixbook and see what it was like to create a photo book with an online design company. When you first visit Mixbook, you are asked to pick out a size for your book. Sizes range from 6x4" mini books to 14x11" Coffee Table books. This gives you some options if you are looking for a specific type of book. Next, you are given the option of creating what is called a "Blank Canvas", which is a book that you TOTALLY design from scratch, or picking an existing theme. I chose to do a blank canvas as it allows me to personalize and make the book exactly as I want. 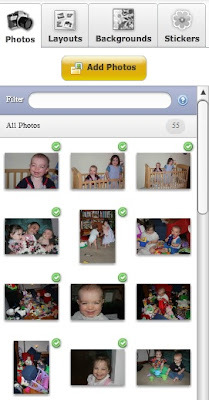 I love how this program shows you which pictures you have used already by placing a green check mark next to used photos. Once you have picked your book size and theme, you are ready to start designing your book! You now have the ability to upload photos to use in your book, choose your individual page layouts, add stickers, re-size and rearrange photos on the book and add fun backgrounds and fonts. 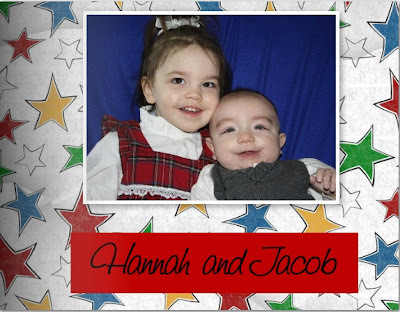 I decided to create a Mixbook Photo Book of my children...as they are very special lights in my life! Using my photos and creativity, I was able to create a gorgeous book...full of memories and special moments that we have shared. Here is a peek at the pages I created...from scratch! I love this page...I was able to add the word "Sweet" because it was a sticker. It turned out super cute!! This was also a favorite page...I picked my own font and also found a super cute sticker to match my theme for the page. The back of the book...again, I picked my own font and was able to write what I wanted. I found using Mixbook to be simple and very organized. Everyone that has seen my Mixbook has been shocked at the quality and clearness of the photos. It has been a real joy to share this book with my family...especially with my husband. He didn't know that I had made it so it was extra special to show it to him. Mixbooks are reasonably priced and you really get a nice book for the price you pay. The 20 page, 11 x 8.5 book that I received retails for $29.99 (not including shipping) which I think is a wonderful price. I was able to have 55 photos in my book and it turned out beautiful! So, in my opinion...Mixbook is an awesome company! I am so thrilled to have found them...I would use them again in a heartbeat. I was impressed by the ease in which I created my book, and the quick shipping time as well. My book is gorgeous and I would highly recommend this company to anyone out there who is looking for a creative way to organize and preserve their photos in a permanent book! Mixbook has offered to giveaway a hardcover, 11 x 8.5, 20 page photo book to one of my readers! This book will be the identical size to the one I received. Here are your entry options!! Visit Mixbook, then come back here and leave a comment letting me know which theme you like the best. :) You do not have to be a blogger to enter, but you must have a valid email where you can be reached should you win. If you do not leave an email address, it must be where I can easily find it. This giveaway is open to US residents (lower 48 states only) and will end 9/21 at 11:59 pm EST. The winner will be chosen using random.org and will be notified by email. The winner will have 48 hours to respond, or another winner will be selected. 1. "Like" Mixbook on Facebook. 2 entries, so 2 comments. 2. Follow Mixbook on Twitter. 2 entries, so 2 comments. Disclaimer: I received no monetary compensation for this post. I did receive a free Mixbook for review purposes. All quotes and stock photos are from the Mixbook website and email. All thoughts and opinions are 100% mine. I like the Garden Wedding book. I like the spring theme! I like the family history theme! I liked Mixbook on FB! love mix book. just ordered a book that will arrive tuesday. I follow your blog on GFC and like you on Facebook! I would love to win this! I like the winter theme! Thanks so much for the fantastic giveaway! I like the family history theme. I love the wedding customized guest book!! friends with mix book on facebook! friends with mix book on facebook(2)! I like the Autumn theme. You have just voted for In My Opinion...! Remember, you can vote every day.